A small army of tourism ambassadors are out on the streets of Fremantle today to offer advice and assistance to passengers from the visiting Queen Elizabeth cruise ship. The luxurious Cunard liner, carrying more than 2000 passengers, arrived in Fremantle early this morning and will depart for Busselton, Adelaide and Melbourne around 10pm tonight. The City of Fremantle’s Visitor Information Services Team Leader Rosetta Letizia said the City’s dedicated tourism ambassadors offered a friendly welcome to all visiting cruise ship passengers. “Today we have 23 ambassadors rostered on for the Queen Elizabeth, stationed at the Fremantle Passenger Terminal, the footbridge, the Parry Street shuttle stop and the Fremantle Visitor Centre at the Town Hall,” Ms Letizia said. “We also have people roving through High Street Mall, plus rolling through the streets on our new three-wheeled trikes. 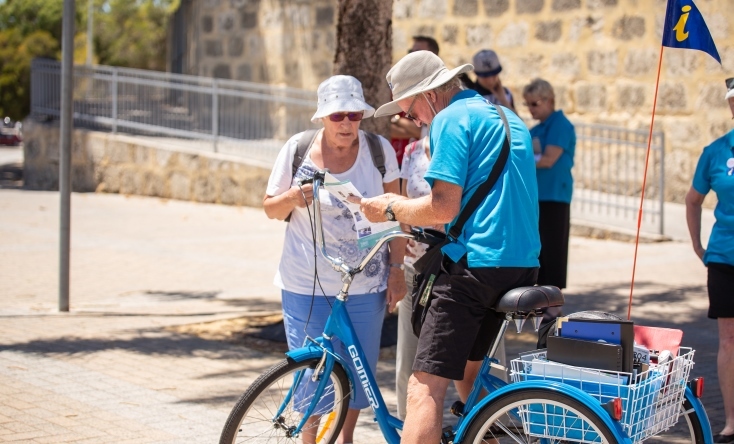 “Our ambassadors are on hand to answer questions, hand out free maps and information, give directions to attractions like the Fremantle Prison, the Round House and Fishing Boat Harbour and offer advice on how to see the best of Freo. Queen Elizabeth is the first of four cruise ships to visit Fremantle this month, with Amadea due to arrive on 12 February, Crystal Serenity on 20 February and Celebrity Solstice on 28 February. Queen Elizabeth will pay a second visit to Fremantle later this year when she returns on 6 December.